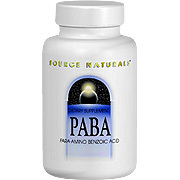 PABA, or para-aminobenzoic acid, is generally classified with the B-vitamin family, although it is not itself a vitamin. The best known role of PABA is as a precursor for folic acid production. Folic acid is important in cell division and the healthy development and structure of red blood cells. Source Naturals PABA Para Amino Benzoic Acid is suitable for vegetarians and HYPOALLERGENIC: contains no yeast, dairy, egg, gluten, corn, soy or wheat. Contains no sugar, starch, salt, preservatives, or artificial color, flavor or fragrance. Warning: If you are pregnant or breastfeeding, consult your health care professional before using PABA Para Amino Benzoic Acid product. 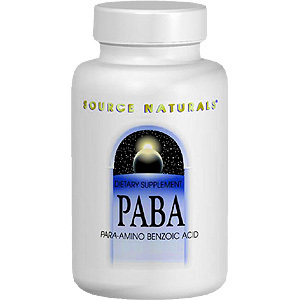 PABA (para-Aminobenzoic Acid) 100 mg.
Other Ingredients: Dibasic calcium phosphate, modified cellulose gum, stearic acid, magnesium stearate and colloidal silicon dioxide. PABA 100mg is shipped in a discrete, unmarked package. Orders are processed immediately and usually take about 3 to 5 working days to be received. We do ask that you try it for 2 to 3 weeks to feel the full effects. Any information received is used only for order processing and shipping purposes. Your information, such as e-mail address, will never be disclosed to a third party.